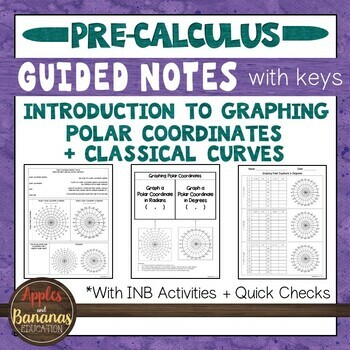 Are you having trouble getting your students to take effective notes during math lessons? 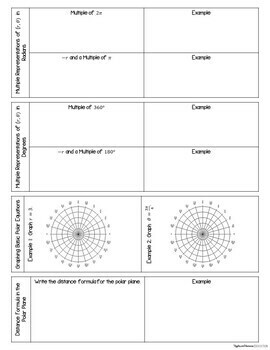 Are you looking for quick activities that can be completed in a math journal or at the end of a lesson as a check for understanding? If so, these activities are for you. Please check out our full-length preview. 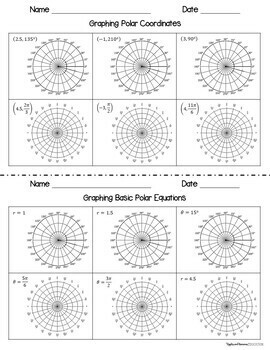 These math journal activities/scaffolded notes introduce students to graphing polar coordinates and classical curves, and are perfect for Pre-Calculus or Integrated Math students. They can be used for introduction of topics or to reflect/review what you have covered in class discussion. The problems listed in this activity packet build nicely on each other if introduced in the order that they appear. Our students enjoy filling them out and organizing them in their math journals so that they can refer back to them throughout the year. These activities are a great way to promote writing in math. Keys are included for reference. **This zip folder contains non-editable PDF documents. 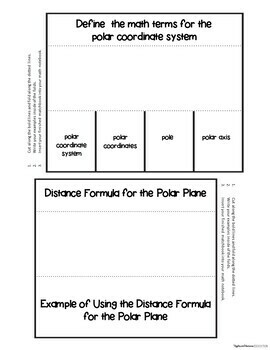 Packet also includes 5 Interactive Notebook activities.